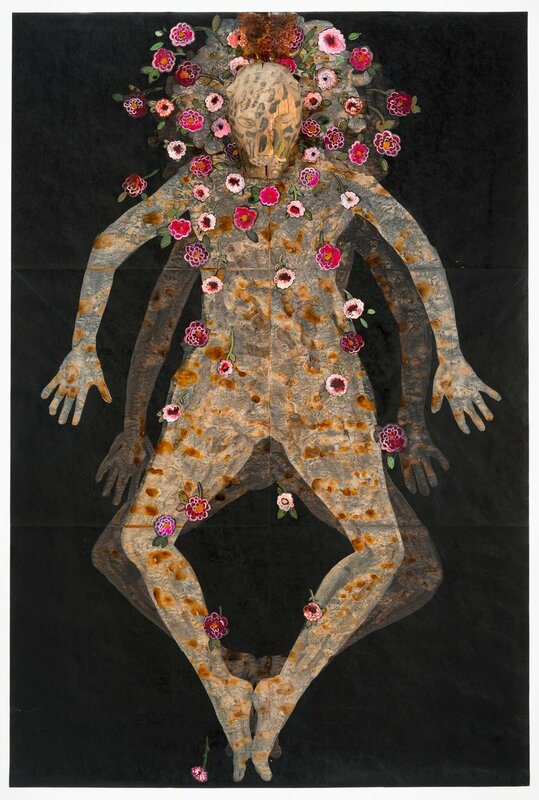 With an explosion of flora, Nancy Friedemann-Sánchez’s exhibition at Weinberger Fine Art’s Drawing Room explores colonialism, identity, and cultural hybridity. In a word, Cornucopia No. 3 is dazzling. The painted collage draws inspiration from Mopa Mopa, a centuries-old Colombian process of stretching and tinting tree resin. Against a deep black background, vibrant flowers, plants, and birds blossom out from a patterned vase. Scattered around the edges of the painting, tiny men point guns into the bouquet. The viewer is struck instantly with the impression that the armed men are moving in on the larger than life botanical arrangement. Though it seems initially that such small figures could not possibly overtake such a massive and stunning array of flora and fauna, we slowly become aware that they inevitably will. In Cornucopia No. 3 Friedmann-Sánchez forces the viewer to engage with the harsh realities of colonialist oppression – with the cruel certainty that men with guns can and will eradicate nature, beauty, and deeply rooted cultural tradition. Cornucopia 3, India ink on Tyvek, 80 x 160 in. Against similar black backgrounds, Castiza and Chola feature somewhat amorphous figures adorned with indigenous masks and decorative Spanish combs called peinetas. Friedemann-Sánchez has commented that the figures in these works are inspired by images taken by TSA machines in US airports. Her appropriation of TSA images serves as a metaphor for modern mechanisms of screening and categorization. In Friedemann-Sànchez’s oeuvre, Castiza and Chola recall caste paintings created by colonialists in Latin America to illustrate racial stratification. Castiza, India ink on Tyvek, Spanish comb, indigenous mask, 45 x 67.5 in. The suspended figures seem to float in their frames, and their limbs sprawl in angular formations. Bright pink flowers cover their faces and bodies, creating splashes of vibrancy that juxtapose the limp bodies. Perhaps these flowers, lain across lifeless figures like a bouquets in an open casket, serve as a memorialization of those divided and beleaguered by colonialist rule. In creating these ghostly figures, Friedemann-Sánchez again pushes the viewer to confront the perils of colonialism. Chola, India ink on Tyvek, Spanish comb, indigenous mask, 45 x 67.5 in. Nancy Friedemann-Sánchez’s work is intentionally and blatantly reactionary. Clearly inspired by the grief of her own displacement, the artist haunts viewers with the memory of indigenous cultures now suppressed and fragmented and due to colonial rule.